The Torah is a very special book for Jewish people that has our stories and rules that help us be good people. The Ten Commandments, are very important for all people of all ages to follow because they serve as the foundation for how we live as Jewish people. Ten Good Rules by Susan Remick Topek. The following materials will be needed for each student:. An illustration of Mt. Sinai in the desert (printed or drawn on sturdy paper or glued to foam or cardboard). A sturdy picture of Moses and of The Ten Commandments (Use stock paper, laminate or foam board). Can be printed or drawn by the children (labels for each may be appropriate for children’s illustration). Small velcro strip with adhesive. A plastic bag (optional) so that the pieces of the student’s craft can stay together. and what do you think he got? what do you think he got? It is advised that you sing through the song before you begin the lesson to ensure that you are comfortable leading the children. In the introduction, the verses of the song will be split up in order to engage students in a conversation about the story that the song tells. What do we know about the Ten Commandments? What do we know about the Torah? Who do you think the “us” in the song is? Since Moses gave us the Torah, what do we do with it? Now that you have learned the song about Moses and how we received the 10 Commandments, we are going to create a craft that we can use to help us share the story! You’ll each illustrate the scene, and then, we’ll use two other pictures, one of Moses and of the ten commandments and a magnet so that we can make Moses “climb” the mountain! Steps: Note: You will need sufficient copies for each student of the pictures indicated in # 1 and #2 below. Draw or find a picture that depicts Mt. Sinai where the Jewish people are waiting for Moses to bring them the Torah. (As an option, you may wish to have students create their own pictures of this event.). Now that we have learned about Moses and the Ten commandments, let’s talk about what they can teach us. Read Ten Good Rules by Susan Remick Topek. After reading the book, make a large list that the children can see, and number it 1-10. Ask children if they can remember all 10 of the good rules, and refer back to the book if children need help in remembering the rules. Display your rules prominently in the classroom and refer back to it, as appropriate, when children need support in following the rules. For Kindergarten+: “G-dCast s The Ten Commandments - A Song for Kids"
Students are able to re-tell the story of Moses climbing Mt. Sinai using their hand-crafted manipulatives. 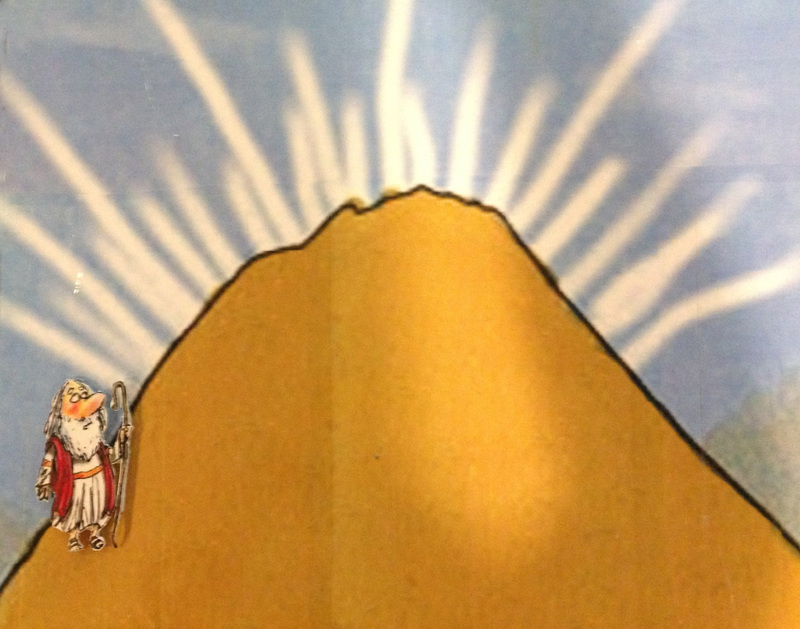 Ask students to bring their craft and song to show and share the story of Moses climbing Mt. Sinai to receive the Ten Commandments with family and with younger students in other classrooms. Ten Good Rules Susan Remick Topek Tod Gohen A counting book for use with very young children, Ten Good Rules explains the Ten Commandments in simple language for a Jewish audience. 15: Parshat Yitro: The Ten Commandments Beyond The Two Tablets?